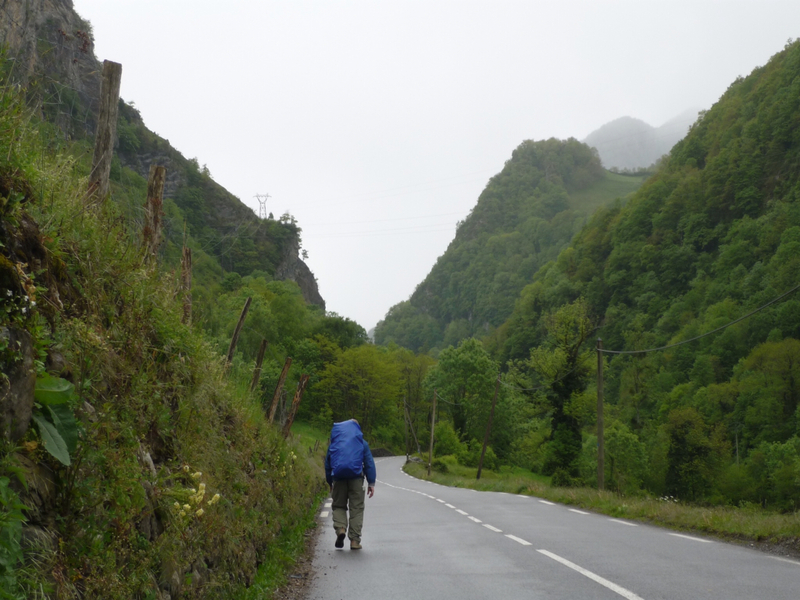 A wet, wet, five hour walk along the mountain road this morning took us into Urdos. 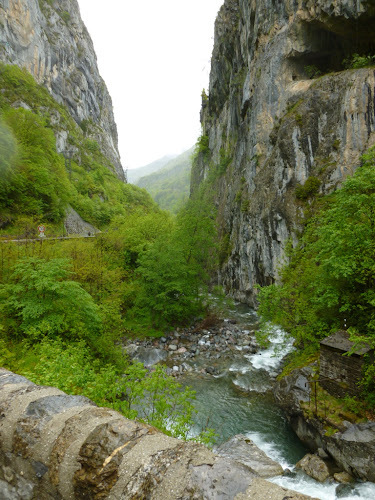 At one point, around 11am, the road divided and we choose the route going up... and that made all the difference (Robert Frost?). The lower road took you into the village of Etsaut and the upper road took us into Borce, a village cuddled into the base of the mountain where we had an interesting twist on the morning coffee break. 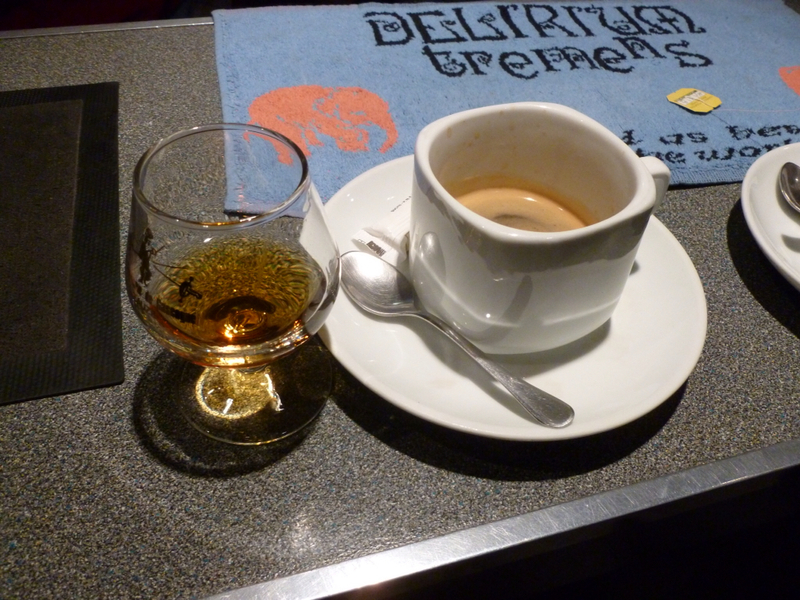 Instead of the expected café au lait it was 'café au cognac' or more aptly named 'café courageux'. minus 3C and snow. I can do this. It might take a couple of café courageux but ...whatever it takes. I think my backpack will be lighter because I'll be wearing everything I own to stay warm. A whole afternoon with nothing to do but sit in the hotel bar, visit with other pelerins and drink wine, tea, wine, tea (Dayton had a few beers - just to be sociable). The rain never let up and, rather than raining itself out, it seems to be getting into a real wet groove. Dinner was an interesting mix of really good food and really good company. We had two British gentlemen, the Dutch man from our gîte in Lacommande, Chris Slater from Asheville, N.C. and Hans from Switzerland. As we were chatting throughout dinner, it came out that Hans, a mountain climbing guide in Switzerland, has led expeditions to Mt. Everest, to Mt. McKinley, a more difficult climb in Pakistan and several other climbs in South America and Africa. It kind of makes our obsessing over the impending snow on the pass tomorrow seem a little ridiculous in comparison. Stay warm and dry, you two. It does look daunting doesn't it! Will be thinking of you as you make this pass. Thank you. Walking over the Somport Pass was one of those milestones we really wanted to do so we're glad the weather is such that we don't have to bus it. Tout va se passer bien. It will all be good.